Welcome to the Good Companions Club. Angie runs the centre with her team of Yvonne, Tricia, Paulo and Matthew. 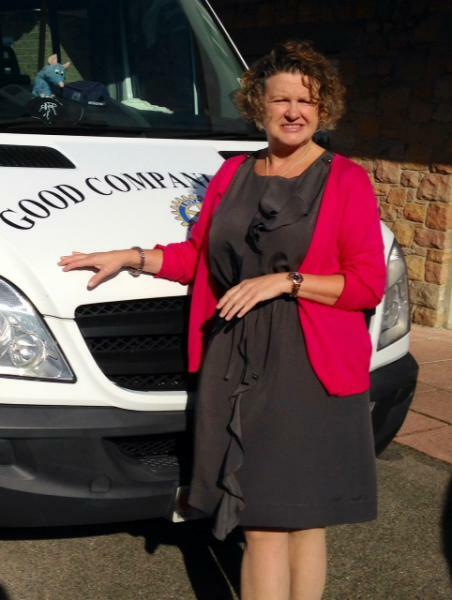 Here we see Angie in front of one of our two minibuses. These will pick you up at your door and drop you back again wherever you live. Our drivers also take you out for lunches and drives around the island. Our aim is to make sure that no one who is alone is lonely. We cater for lots of different interests, if we don't do what you're interested in then tell us and maybe we can include it in our new activities programme. Tea and Coffee and Biscuits are always available while you sit in our lounge and decide what you want to do that day. Will you be? It's up to you. Also how many times do you want to come each week? Will it be every day or just once, again that's up to you! Of course at lunch time you are in for a real treat. A hot meal is served every day with a sweet to follow. A selection of what is on offer, Fish and Chips, Gammon and Pineapple, Toad in the Hole, Shepherd's Pie, Steak and Kidney Pie, Roast Dinner and Fish Pie all served with veg and potatoes. And on top of all that our activities co-ordinator Mary will help you with craft work if that is your thing. To get the full story, download our brochure and a sample of our weekly planner. Then just give us a call, pop in and look round, we think you will like what you see. See our plans for redevelopment.